B. Thomas (Arlington, Texas, United States) on 9 February 2019 in Lifestyle & Culture. The Bora Bora summer months are December, January, February and March. Summer is the wet season in Tahiti. During these months there is more chance of rain and the temperatures can be slightly higher but not hot. Occasionally, strong storms do develop but do not last long. The lagoon water temperature is warm all year round. French Polynesia is on the eastern edge of the South Pacific cyclone/hurricane belt so it's rare to have cyclones in Bora Bora. 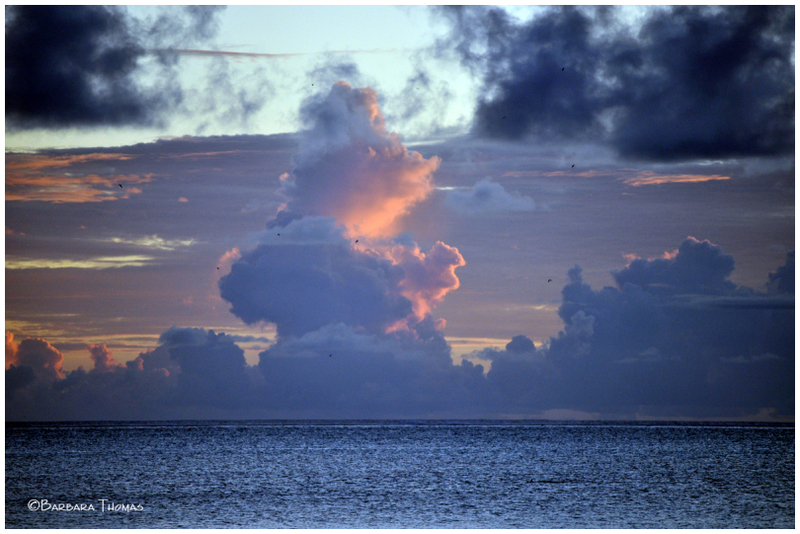 We often walked to our favorite beach to watch the sun set, but one night we saw storm clouds instead. We experienced some rain showers, and one storm but even those were beautiful. *In January, 2013 I got to go on my bucket list dream trip to the French Polynesian Islands of Tahiti, Moorea, and Bora Bora. Some photos were posted here on Aminus3 at that time, but there are so many more that I never got to. I will revisit the beautiful island of Bora Bora for this series. this stormy sky is sumptuous. The central cloud seems to say "pay attention to me!" Looks beautiful..so long as the storms are not disastrous ! Superb capture of this impressiv and beautiful cloud and great composition . such beautiful clouds, colors & lights! Those towering clouds catching the warm light are gorgeous. A great view of this spectacular storm clouds. Beautiful color! such beautiful light behind the clouds, wonderfully captured!